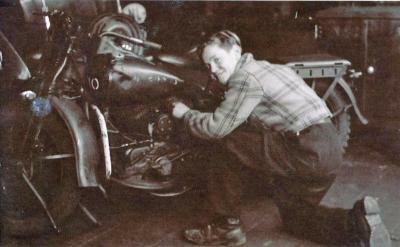 Anne-Willem Meijer, now William Meyer, age 16 working on a motorcycle. Location: somewhere in Holland. Meijer delivered ration cards to families who were hiding Jews from 1941-1943 when he was caught and sent to Fught concentration camp as a political prisoner.